From time to time, your garden will be visited by ladybugs. Ladybugs are good insects that will help your plants, so keep and eye out for them. If you find one, touch it and you’ll get a reward (don’t worry, the ladybug will stay there after you touch it–you don’t want to scare it away!). Ladybugs will often be found resting on the sides of the pot (outside or inside), or on the dirt. They can be on the back side of the pots too, so make sure you look there. 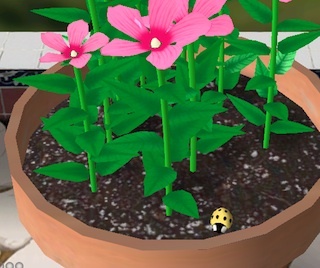 Ladybugs are easily scared with movement, so they’ll go away as soon as you switch to a different pot. 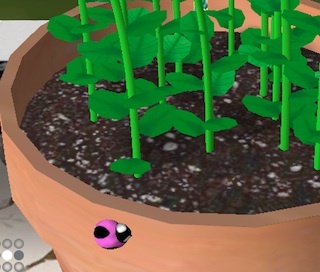 Common ladybugs are red and will give you some amount of Green Thumb Points for finding them. 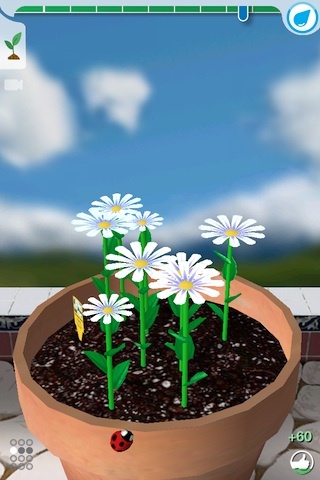 You can see the Green Thumb Points amount you received on the bottom right corner. Uncommon ladybugs are yellow and have more spots. They will usually give you Fertilizer or Color Dust if you find them. Rare ladybugs are pink with two large black spots. They might take a lot of patience and searching to find them, but they’re worth it. They will give you a full credit if you find them!